This past weekend a video was posted on the BBC Look North Facebook page featuring a little boy by the name of Bailey Matthews. 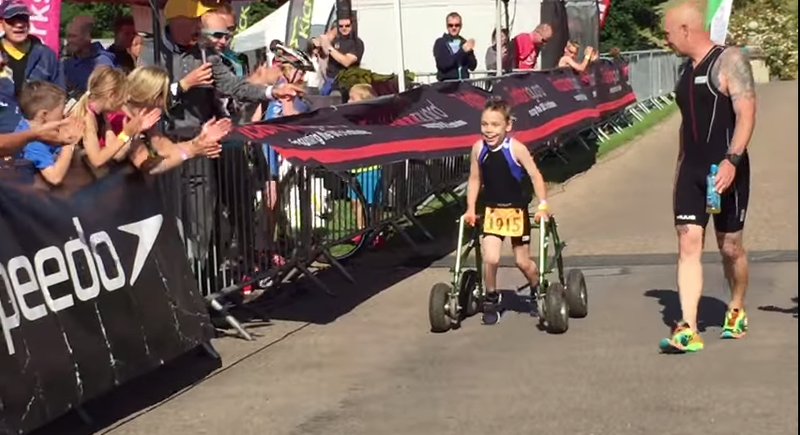 The eight-year-old is from Doncaster in the UK and just finished his first ever triathlon at Castle Howard. I should also point out that this young boy has Cerebral Palsy. As Matthews was coming down the finish line shoot, he announcer said his name and everyone started to cheer for him harder. As they cheered harder, he ran faster until he realized he did not want or need the assistance of his walker anymore. He let go of the walker and finished by himself, unaided, on his two feet. He received his medal and hugged the gentleman walking beside him who I guess was his dad. You can tell in this video how happy and proud he was that he did it. If there is any industry that allows anyone and everyone to compete and finish, it is the endurance industry. Each week we see more and more accomplishments happening from double amputees completing Ironmans to blind runners finishing marathons to the even more insane, a man running 50 Ironmans in 50 days in all 50 states. Bailey just showed that all it takes once again is determination and a lot of heart to complete your goals. If there is one video you need to watch, it is this one because it will definitely warm your heart.